Our project seeks to better understand American woodcock migration throughout eastern North America. We kicked off our pilot season in Fall 2017 when we marked 6 woodcock with satellite transmitters in Maine prior to fall migration. These tags weigh between 4 and 7 grams and will periodically send us data on each woodcock's location and status (live or dead) as it makes it fall migration to the southeastern US. You can download our first year's project report at the link below. stopover sites where woodcock rest and refuel during migration. Check out our migration page for the current status of our marked birds and examples of data we are collecting during migration. 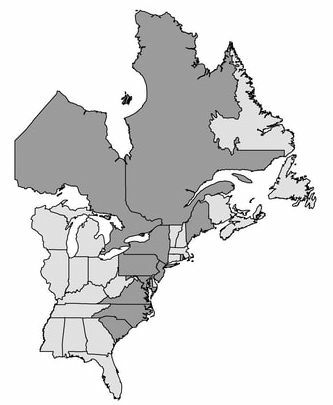 Map of currently participating states and provinces (dark gray) where we are marking American woodcock with GPS transmitters.